The preparations to welcome a baby start way ahead of its birth. With the whole family indulging in top baby brands to get the best daily use products for the newborn, the ignorance is often at its peak. From skin care products to diapers and baby wipes, established names in the baby-care industry leverage the blind faith of the market and people tend to buy their products without taking into consideration the listed ingredients. But, the harsh reality is that most of these products comprise a list of chemicals that serve to be extremely harmful to your baby. One such product used daily for the supposed care of an infant is “baby wipes”. These might be doing more harm than good to your baby’s ultra-sensitive skin. With modernization in the lifestyle, wet wipes have replaced the traditional practice of using cotton and water for cleansing during a nappy change and are handier and easier to use. It saves time and is deemed to be more hygienic. However, if your little one still gets those red, itchy rashes on the bum even after all the care; the baby wipes are to be blamed. Believe it or not, most baby wipes contain ‘polyester’ – a water repelling material made of plastic. The use of polyester instead of organic or natural fabric cuts the manufacturing costs thereby increasing the profit margins of these well-established brands. However, it greatly impacts your baby’s skin and leads to allergies and rashes. How to determine the presence of polyester in wet wipes? Wondering how to protect your baby from the unintentional exposure to unpleasant chemicals? Here’s an easy DIY flame test you can conduct on the baby wipes to see if they are safe to use. All you require is a baby wipe, a candle, and a matchbox. -Light the candle using a matchstick. -Dry up the baby wipe, hold it from a corner and burn it in the flame. If you sense a bad smell like that of plastic burning, it confirms the presence of ‘polyester’ in the fabric used for a wipe. You will also notice the formation of hard black residue or lumps on the burned edges which convey the inferior quality of the fabric and huge amount of polyester used in it. Such chemically formulated wipes are a definite no-no for your munchkin. On the contrary, if you sense no bad smell or a smell similar to that of burned cloth or paper, it denotes that the wipes are made up of natural fabric and aren’t comprised of polyester. Moreover, there will be soft ash-like material instead of hard lumps. You can rely on such wipes to be safer for your baby. Although the percentage of polyester varied with each brand, most of the popular baby wipes fail the flame test due to a cheap fabric. However, one brand that came out with flying colors is Mother Sparsh 98% water-based wipes. When tested, these wipes burn into ashes without exhibiting any foul smell thereby confirming that no these are made up of natural and organic materials. The Mother Sparsh 98% water-based wipes are so gentle on your baby’s skin that they are often claimed to be “as good as cotton and water”. The use of 100% natural fabric such as cotton, make this brand highly recommended for a super soft baby skin. It is the best among all the natural baby wipes available on the market as they are water-based sans any harmful chemical formulation, hence no side effects. Unlike other brands, it has a superior quality of fabric that is extremely soft just like a mother’s touch. Mother Sparsh wipes are 100% biodegradable, which makes them not only suitable for babies but also for the environment. As your baby’s skin is a lot more sensitive than yours, it is essential that all the products are selected carefully. After all, your baby’s health and well-being matter the most, right? Recent studies have shown that your baby’s skin is so fragile that it is affected by the slightest of touch. If that is the case, then imagine the discomfort your baby must be in because of its diapers. Yes, you heard it right! 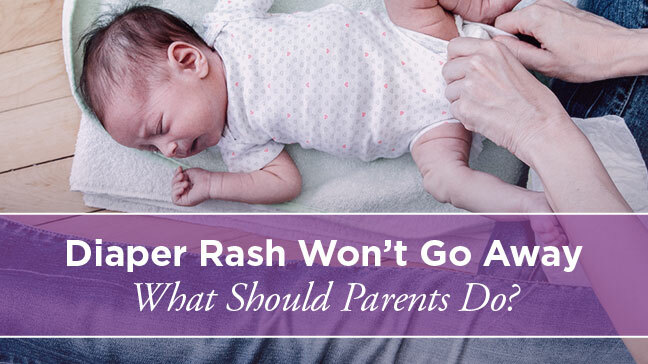 The diapers or wipes that you use for your baby are the main reason behind those gnarly diaper rashes. These are often composed of harmful materials like polyester, parabens and alcohol which are extremely harmful to the baby’s skin. Thus, to avoid making the same mistakes that you’ve been making in the past, opt for Mother Sparsh Baby Wipes. The Mother Sparsh Baby Wipes are made up of 100% plant material and are free from any kind of harsh materials like alcohol, polyester or parabens. These wipes are best for all the parents who care deeply for their babies. The Mother Sparsh Baby Wipes also come in handy for working mothers who are juggling their personal and professional life. Hygiene is a major concern among parents; especially for those who are always on the go and travel often. As everything needs to be sterilized before it touches your baby’s skin, the Mother Sparsh Baby Wipes will ensure that your baby’s skin stays free from any harm. Why should you buy Mother Sparsh Baby Wipes instead of others? 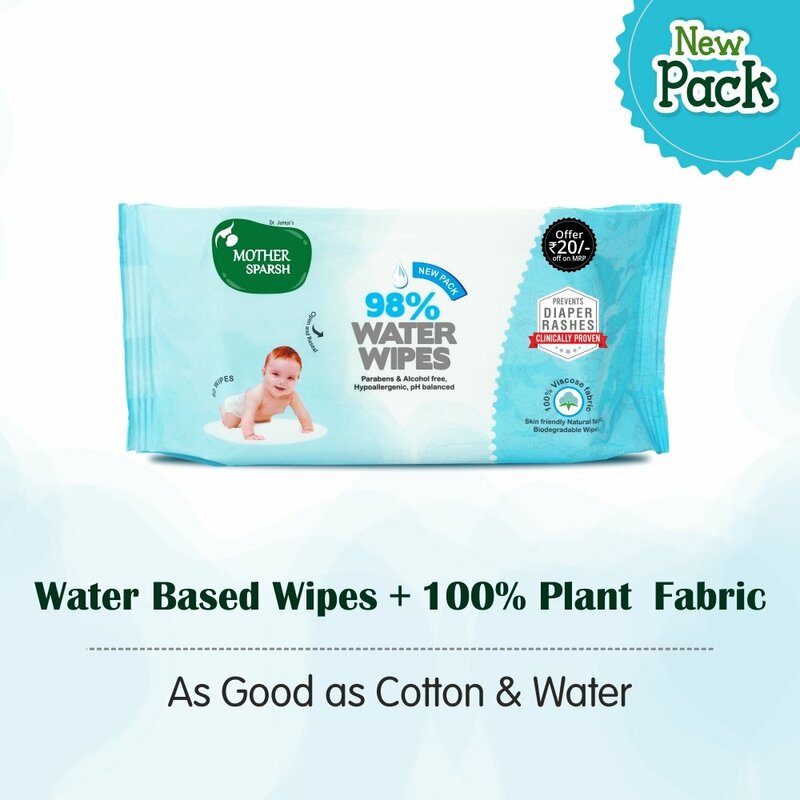 Mother Sparsh Baby Water Wipes are made up of 100% plant cotton material. 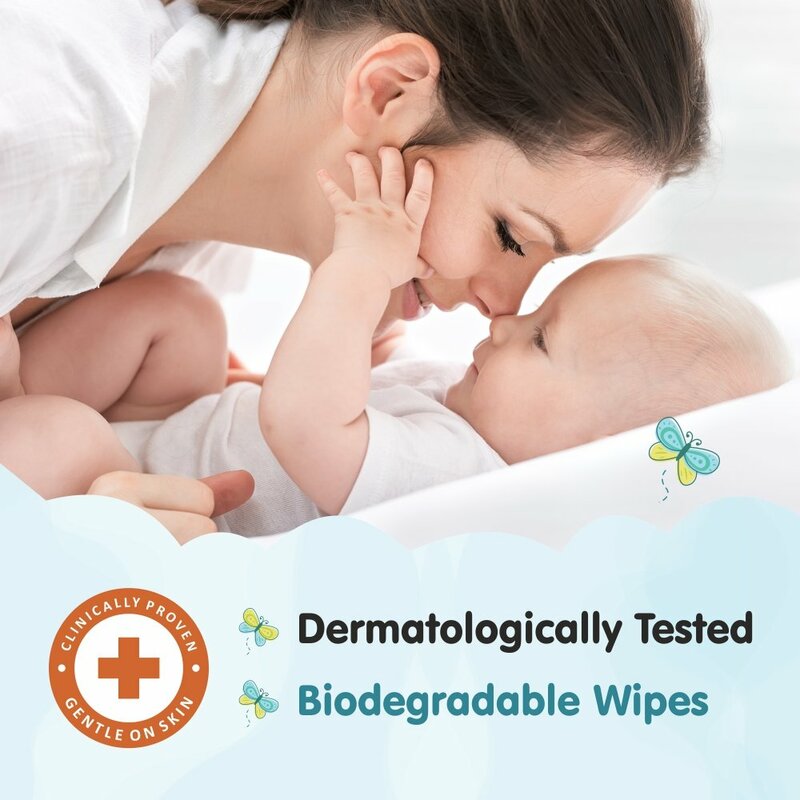 These wipes are composed of 98% water, which makes them pure, soft and safe on a baby’s fragile skin. The wipes are gentle and can be used on a newborn baby’s skin. You may also use these wipes as facial wipes, for the times when your little one makes a huge mess out of their oatmeal. The baby wipes are kind to your baby’s skin. It’s an amazing option for every parent. It keeps the baby happy, smiling and comfortable at all times of the day. Water-based baby wipes are the best option for all parents out there. The baby wipes contain vitamin E which effectively forms a protective layer over the baby’s skin. It also helps in maintaining firmness by inducing fine collagen lines formation which effectively removes dirt and grime from the skin. The Mother Sparsh Baby Wipes are Paraben-free and should be preferred over the conventional diapers or wipes in the market. Parabens are primarily used as preservatives in aesthetic products. They are mostly termed as non-irritating substances but may develop skin allergies, rashes and even dermatitis. Also upon being exposed to sun rays, some parabens may react with UVB rays, which results in skin ageing and even DNA damage. 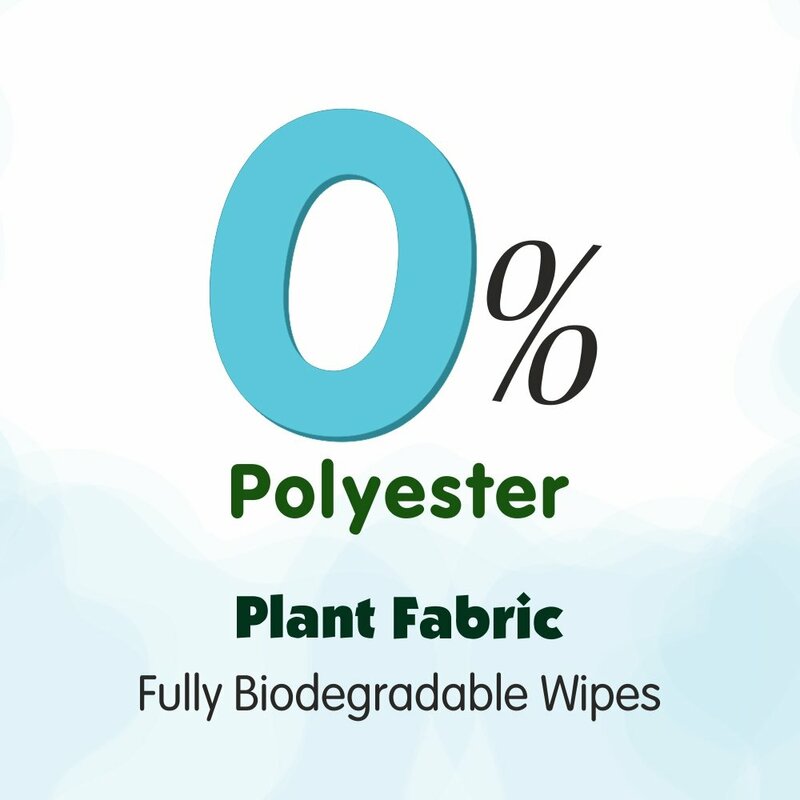 Mother Sparsh Baby water Wipes are completely paraben-free. Alcohol is another cheap way to kill germs which are used in a lot of wet wipes along with other chemicals that irritate your baby’s skin. Mother Sparsh baby wipes, however, are made from plant cotton and water. Products containing alcohol should be avoided at all costs, the nitty-gritty sounds pretentious but it is of paramount importance for keeping a baby healthy. A baby’s skin is likely to dry over time and requires constant moisturizing. The Mother Sparsh Baby Wipes keep your baby’s skin moisturized 24/7. Being composed of plant cotton and water, these wipes act as a natural moisturizer for your baby’s skin. The wipes have been clinically tested to prove that these are Hypoallergenic in nature, i.e the wipes do not cause any sort of allergy to the baby’s skin. These do not irritate the baby’s skin and are a preferred option for all the Dad’s wishing to spend some quality time with the babies. The Mother Sparsh Baby Wipes do not cause any sort of diaper rash or skin allergy. These wipes are formulated specifically for your baby’s supple, soft & delicate skin and look after all your baby’s needs. They are 100% safe and are made entirely of water, the Mother Sparsh Baby Wipes are also pH balanced. Most importantly, these are completely biodegradable. The brand Mother Sparsh has been working hard to promote its principles of going green. Thus, it came out with these biodegradable wipes that won’t pose a threat to our environment/our future generations. These smell like a fresh breeze in the Annecy Lake of France. The packaging is also great. You pull one out and then you seal it. They’re multi-purpose and are in the size 15cm x 20cm. The package is small so you can carry it around in your bag. A single package has 80 wipes. It has natural antioxidants which keep the skin firm, keeping it safe from bacterial infection; can also be used to wipe hands. The Mother Sparsh Baby Wipes are available on the Amazon. To buy the Mother Sparsh Baby Wipes – Click here.